Holiday Stress or Holiday Rest.. you choose! | Eat, Train, Thrive! The Holidays are stressful at times, right? We know stress can affect everything in our lives – good and bad. We want more good than bad of course. It’s that time of the year, where things get crazy fast! I know for me, it seems the days will get shorter and shorter during these next few weeks. Before you know it, you’ll blink an eye and it’s Christmas already. As I write this, Halloween and Thanksgiving have come and gone, and Christmas is here! Crazy, right?! Where does time go! These times can be so stressful, right? Deadlines at work, kids out of school for various holiday breaks – you’re like, what do I do with them? School functions, holiday parties, and don’t let me forget the travel that you may have to do. So, how do we stress less and get a little more rest when there seems to be none in sight? Great question! I’m not gonna say it will be easy, because it probably won’t be, but there sure are ways that you can minimize it. I’m also not gonna pretend all my holidays over the years have been peachy keen, it wasn’t probably until the last couple of years that they have been stress-free. I was like enough is enough. I was tired of gaining weight every holiday, and not feeling good in my clothes. It wasn’t the weight that bothered me much, just the way I felt as a whole. Dealing with family, especially when I traveled – the worst is trying to visit and appease everyone. You know how the family gets if you don’t visit long enough or come by and see them right away. I’m like; Y’all got the nerve, I’m the one that drove thousands of miles to visit. Heck, visit me over here. Another stressor is gift buying! 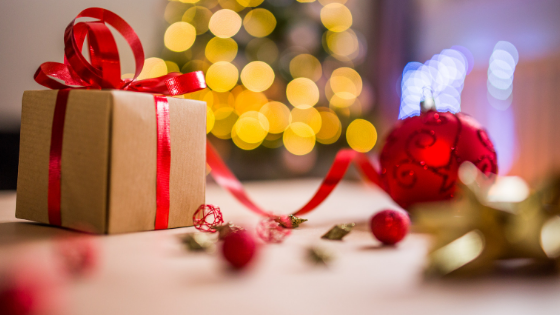 Holiday buying can add up quickly, especially when you have a big family, travel, and all the other festivities that go on between now and Christmas. One thing to remember about the Holidays is that it can be Holiday or Christmas rest and not Holiday/Christmas stress. One thing to do is bring your focus back to what Christmas is all about. It’s not just about gifts. It’s about our Lord and Savior Jesus Christ – that is if you believe. If not, definitely no judgment from me – nothing but love! It’s also spending time with our loved ones and being 100% present, you can’t do that if you are stressed to the max about gifts and such! As for the stress of spending and how to deal with that – Be mindful of how much you are spending. Heck, if you ain’t got it, don’t spend it. Big family? Draw names for gift buying, or limit gift prices. The last thing you want is to be stressed and in debt, and credit cards maxed out once January 1st rolls around. In my mind, Christmas and debt shouldn’t go hand in hand. If that’s the case, you might as well leave all the Christmas and Holiday décor up after the 1st, because Christmas is still going on for you. So, how do we deal with stress for the Holidays? Accept that the holidays will be a hectic, stressful time – but it doesn’t necessarily have to be for you. Knowing that this is the case, it may just help you feel better and be better equipped for the holidays. In the last few paragraphs, I talked about the money thing. I know that’s a touchy subject for some, but, plain and simple, don’t spend it if you ain’t got it. Try to keep a routine of some sort. It may not be your normal one prior to the holidays, but do your best to establish one. Exercise is a huge stress reliever. One of the first things we let go of during the holidays is exercise. Even if it’s just walking – do it. Make time for it, get the family involved. Something is better than nothing! During these hectic times, you’re probably thinking “yea right, how am I to get to the gym with no time.” Simple! The solution is 20 -30-minute workouts right at home. All you need is a pair of dumbbells, you’ll still be able to get your workout in. We’ll have you tackling the Holidays like a boss! Sleep! This is a tough one, I know. We are up later than normal, hanging with family and what not, so I know sleep is also lacking during the holidays. Do your best to get 6-8 hours at night. You’ll feel better, be less grumpy, and it will help to ward off the extra pounds and sickness. Holiday rest or Holiday stress, you choose. Let me help you with the Stress that tends to show up during the Holiday! Grab my FREE THRIVING Through The Holiday Season Blueprint!